Today was one of those days that I needed something sweet. 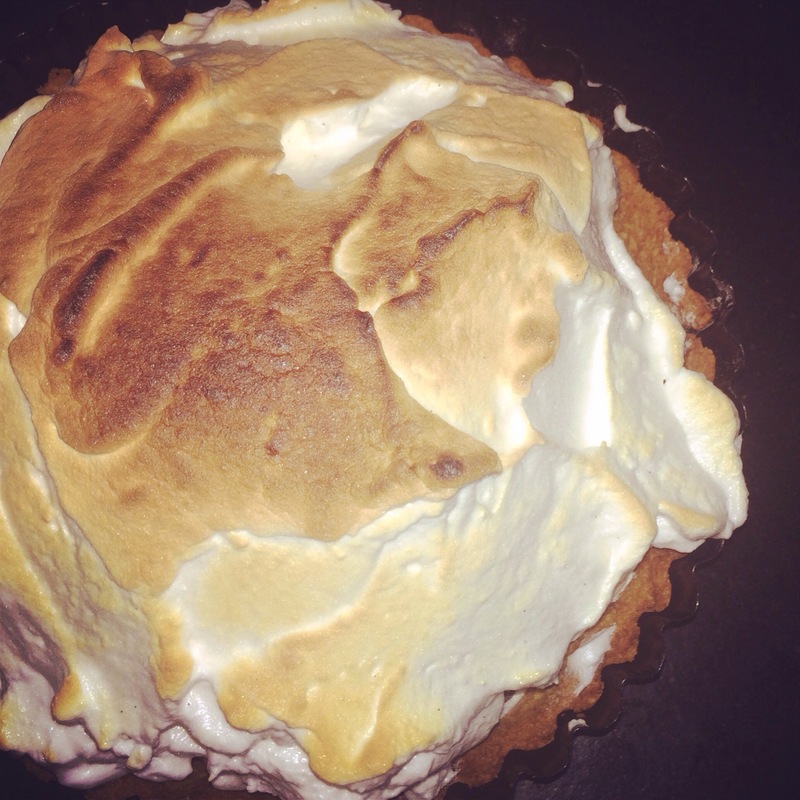 Last weekend I went for dinner to a friends house and I made Lemon Meringue Pie, which tasted mega but the lemon curd didn’t set. So today I made another one! of cream of tartar (if you don’t have this you can add a half teaspoon of white vinegar). To make the pastry, put the flour, butter, icing sugar, egg yolk (save the white for the meringue) and 1 tbsp cold water into a food processor. Using the pulse button so the mix is not overworked, process until the mix starts to bind. Tip the pastry onto a lightly floured surface, gather together until smooth, then roll out and line a 23 x 2.5cm loose-bottom fluted flan tin. Trim and neaten the edges. Press pastry into flutes. The pastry is quite rich, so don’t worry if it cracks, just press it back together. Prick the base with a fork, line with foil, shiny side down, and chill for 1⁄2-1 hour. Preheat oven to 200C/fan 180C/gas 6. Bake the pastry case ‘blind’ (filled with dry beans) for 15 mins, then remove the foil and bake a further 5-8 mins until the pastry is pale golden and cooked. Set aside. (You can do this the day before to save time.) Lower the oven to 180C/fan 160C/gas 4. Combine sugar and 200ml water in a small pan and bring to the boil, stirring continuously with a wooden spoon until sugar dissolves. Reduce heat to medium and brush down sides of pan with a clean, wet pastry brush to remove sugar crystals. Start whisking eggwhites with cream of tartar in the clean, grease-free bowl of an electric mixer until soft peaks form. Meanwhile, bring sugar syrup to 121C (hard ball stage). Increase speed to high and with motor running, gradually pour syrup into meringue. 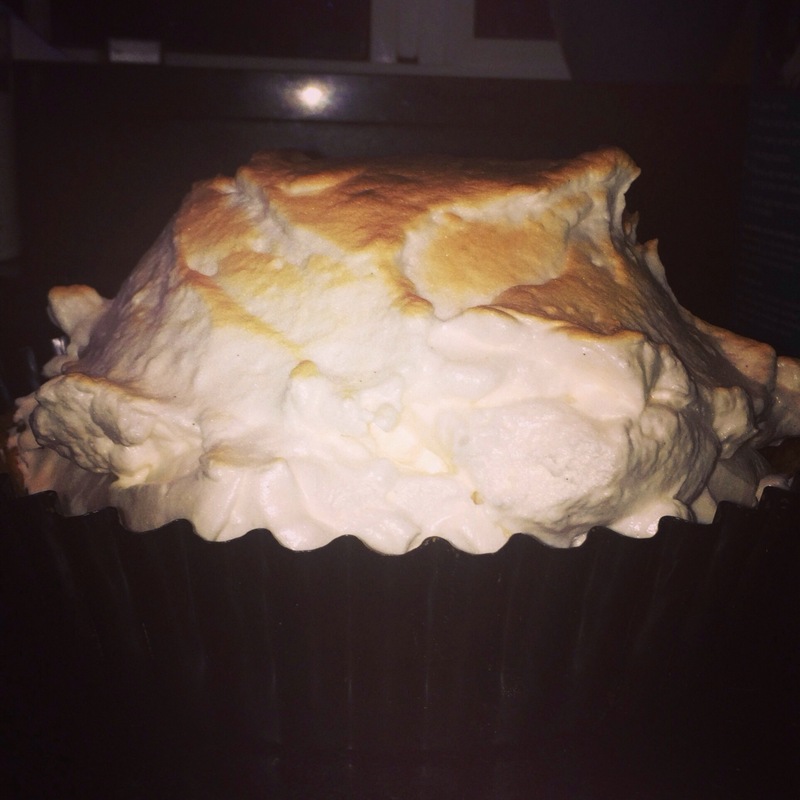 Beat at medium speed until cooled to room temperature and meringue is thick and glossy (15-20 minutes). 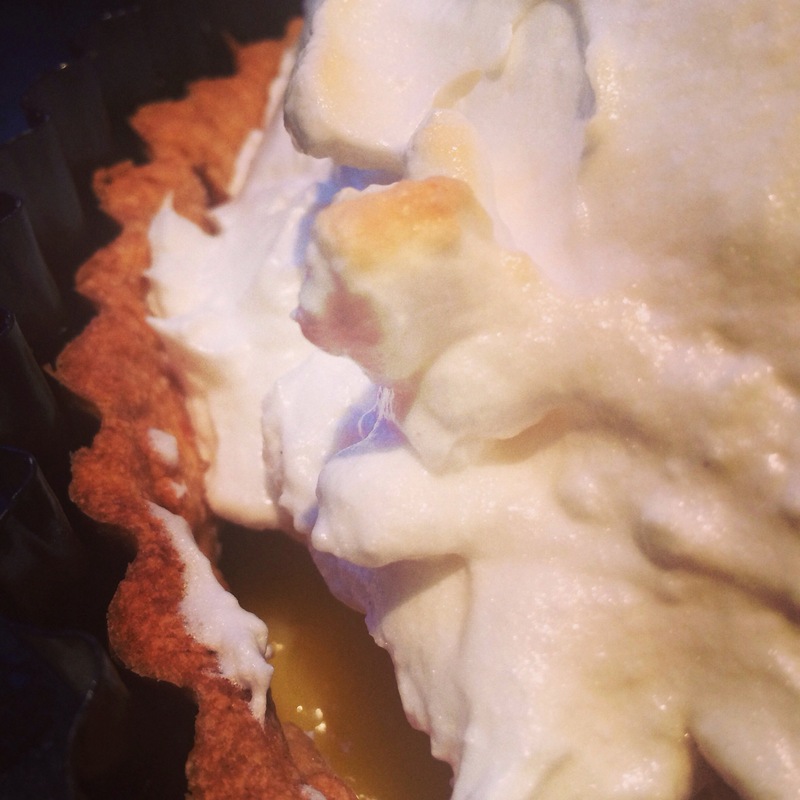 If you do not have a sugar thermometer you will have to make the meringue the traditional way. Put the grill on and slightly brown the meringue under it. As the sugar is so hot the egg whites are cooked. Put the kettle on and enjoy a nice cuppa tea and a slice of cake! !